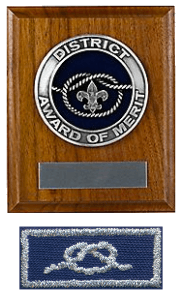 The District Award of Merit is a council award presented by districts to registered adult Scouters who render service to youth of an outstanding nature at the district level. Each district is allowed to give up to 1 award for every 25 traditional units (or fraction thereof) within in its geographical territory, although all awards need not be given. Any registered adult Scouter (21 or older) who has a record of quality service to Scouting, his or her community, and non-Scouting youth, is eligible for nomination. A professional Scouter or other council employee may not receive this award based on employment service. However, a professional Scouter or employee who also serves as a volunteer Scouter may be eligible based on his or her volunteer service. The award is presented annually at a time determined by each district (usually their district banquet). A nomination form is available here. 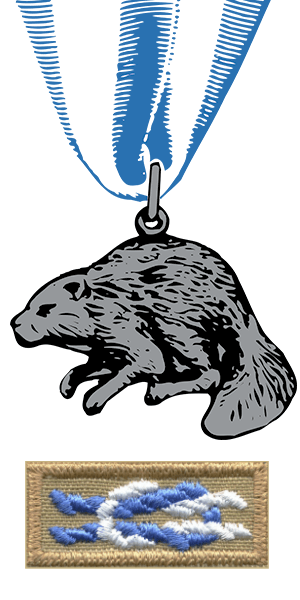 The Silver Beaver Award is presented by the Boy Scouts of America through the local council to adult volunteer Scouters for their distinguished service to youth and their community. It is considered to be the highest award a council can bestow upon a volunteer Scouter. Any registered adult Scouter (21 or older) who has a record of quality service to Scouting, his or her community, and non-Scouting youth, is eligible for nomination. Nominations will not be considered for former professional Scouters or council employees within 5 years of their leaving employment with the BSA, or for posthumous awards. The Silver Beaver is presented at the annual Council Banquet. A nomination form is available here. In 2010, the National Eagle Scout Association established the Glenn A. and Melinda W. Adams National Eagle Scout Service Project of the Year Award (NESSPY) to recognize valuable service of an exceptional nature by a Scout to a religious institution, a school, community, or other entity. The award recognizes the Scout for his Eagle Scout service project, which is part of the requirements for earning the Eagle Scout Award. Each local council will choose a council-level winner, and from that pool, each region will pick a region-level winner. A national winner then will be selected from the four regional finalists. A nomination form is available here. The Blue Grass Council Exceptional Eagle Scout Award (EESA) was established in 2015 to recognize Eagle Scouts within the council who have distinguished themselves through continued service to others. The award (formerly known as the Blue Grass Council Outstanding Eagle Scout Award), has been given annually since 2004 by the Blue Grass Council NESA Committee to one deserving youth and adult. The award may not be granted posthumously. The NESA Outstanding Eagle Scout Award (NOESA) was established in 2011 as a prestigious recognition granted by the local council’s NESA committee to Eagle Scouts who have demonstrated outstanding achievement at the local, state, or regional level. Unlike the Distinguished Eagle Scout Award, which is a national award, the NOESA recognizes Eagle Scouts whose efforts have made a positive impact closer to home. The award may not be granted posthumously. The Distinguished Eagle Scout Award is the National Eagle Scout Association’s highest recognition. The award was established in 1969 to recognize Eagle Scouts who, after 25 years or longer of having received the Eagle Scout Award, have reached the highest national level of success in their field. In addition, these recipients have demonstrated a strong record of volunteer leadership service to their community. All DESA nominations must be made through the candidate’s local council with approval by the council’s NESA committee. The award may not be granted posthumously.